Are you wasting the most productive time of the day? If you do not have a morning routine, you are. Rise and Shine! 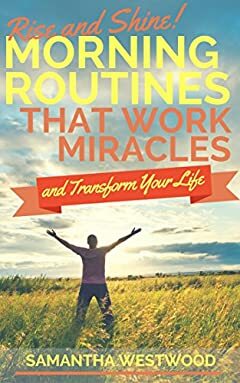 Morning Routines That Work Miracles and Transform Your Life will show you how to change your morning routine and ultimately change your life. There have been stories in the news lately talking about how one thing that almost all successful people have in common is a strong morning routine that they do not deviate from. Successful people ranging from entrepreneurs like Bill Gates and Steve Jobs to bankers, politicians, and even Hollywood stars all say that find the morning routine that works for them was one of the keys to their success. Finding a morning routine that works for you can launch you onto a successful path and help you find the balance that you have been looking for. What makes a good morning routine is different for everyone. For some people starting the day with intense exercise like running is the way to kick-start their brain and get their productivity flowing. For other people, quiet meditation is the key to a productive day. This book can show you how to identify what morning rituals are the best for you based on your personality and lifestyle so that you can turn get up in the morning from a necessary evil to something that you look forward to every day. It is not just adults who can benefit from a morning routine. Everyone in your household will find themselves working harder and enjoying life more with a good morning routine in place. Teaching children the value of a morning routine, when they are young, will help them focus more, stay organized, and learn healthy habits that will lead to success later on. The tips and information in Rise and Shine! Morning Routines That Work Miracles and Transform Your Life will show you how to transform your morning routine and transform yourself.